The rabies outbreak in Sarawak is currently contained and the Sarawak Veterinary Services Department is conducting vaccination programmes, surveillance and awareness campaigns. The State Disaster Management Committee (SDMC) has given the assurance that the outbreak is contained. The Sarawak Health Department with the cooperation of the Veterinary Services Department and the local councils are working together to mitigate new occurrences. 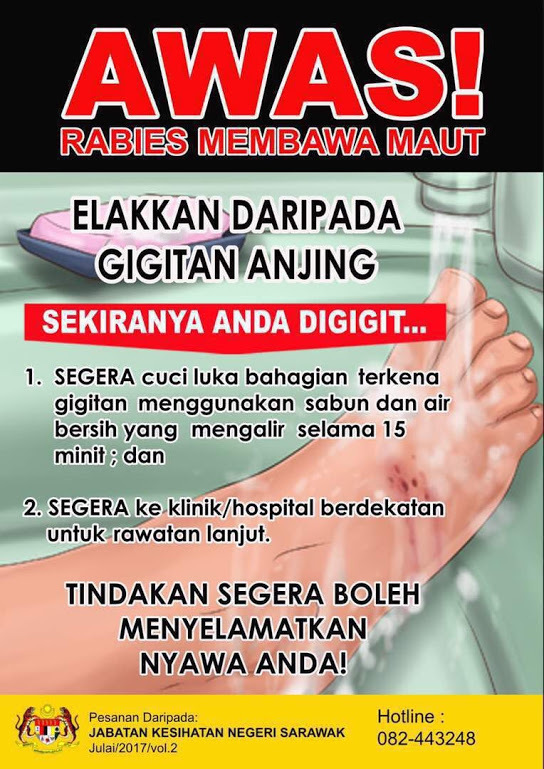 Visitors planning on traveling to Sarawak are not required to receive rabies vaccinations, but in the case of being bitten, they are advised to wash the wound with soap and hold under running water for at least 15 minutes before proceeding to the nearest health facility for vaccination. Those with a history of dog bites in Sarawak between April 1 until now to go to the nearest health facility for a check-up. The outbreak was first detected in the Serian district at end of June, approximately 50km from Kuching city. For further enquiries, please contact the hotline number at + 6082 443248 (Jabatan Kesihatan Negeri Sarawak).